I am in the midst of completing this crackle project for exchange gift (EG) in one of the local forums. The theme is crackle and decoupage. I think I already mastered the technique of crackle using Plaid FolkArt Crackle Medium. This time instead of the usual white basecoat, I used Jo Sonja Carbon Black. For the topcoat I used Americana Antique Gold. I feel that using a black basecoat makes the crackle more significant. I will share the picture of the decoupage bottle later. Oh, for this glass bottle, I applied sealer to make sure that the basecoat acrylic paint will stick nicely once painted on the bottle surface. 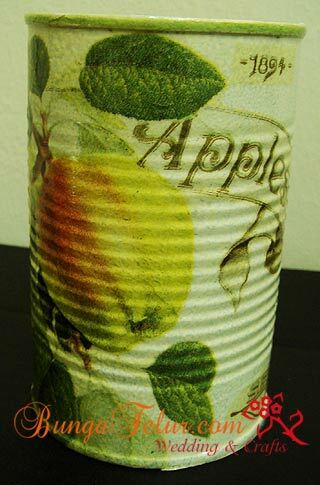 I finally get the chance to snap and edit the picture of this decoupage apple tin. Well, it’s actually an empty tin of button mushroom, which has been cleaned, sealed and painted with primer. 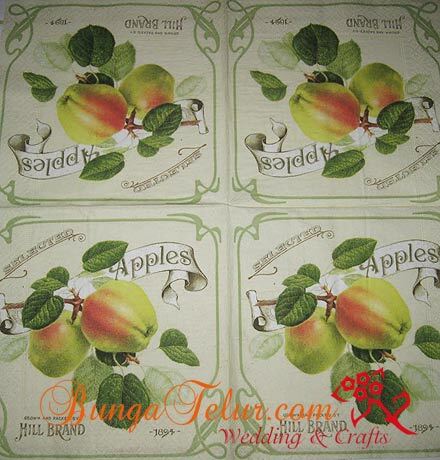 Remember the previous entry about the paper napkin with apple motifs? Here is the outcome after many days of working on the empty tin. 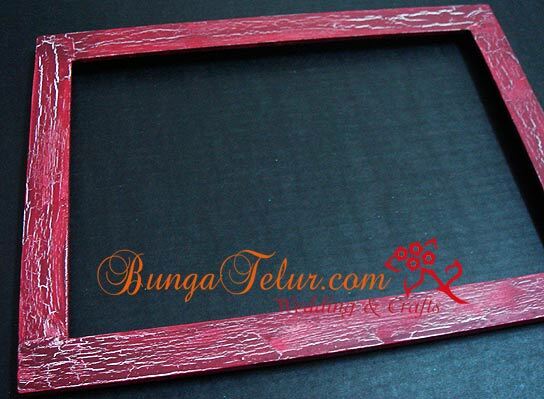 For this decoupage project, I used gloss varnish. After about 3 layers of the varnish, it looks really glossy. Actually I thought of applying opal dust on some of the motif, but I was in a rush and put on varnish after the second day of sealing all the paper napkin motifs..isk! Maybe I will put on some just to experiment on what will happen if we put the opal dust after we already applied 3 layers of varnish. Will share later once I manage to find the time to do so. I love collecting paper napkins, especially one with fruits motif. This is one napkin that I bought from a seller online more than a year ago. I have done decoupage on tins using paper napkins with motifs like peach and lemon. I will share the pictures later. At the moment I am waiting for the work-in-progress tin to dry out so that I can apply the gloss varnish. This apple motif will be added in the fruits collection soon! I finally get it right! After many trial and error, I managed to get the crackle effect I would say that I am happy of. The bottom coat was white gesso. The frame was from IKEA. I sanded, applied sealer and painted with gesso before I used the Plaid Crackle Medium. After reading some online tips and watch Youtube on how people apply crackle medium, I tried to follow as much as possible. 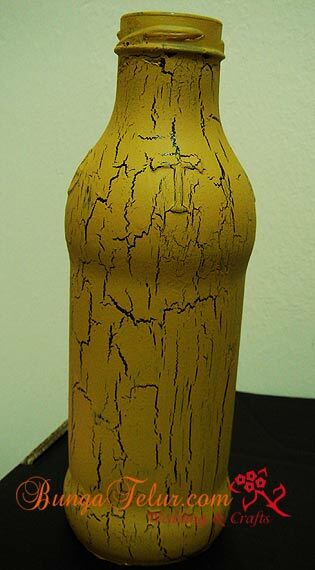 The crackle medium was applied using thick brush, some in zig zag while some in straight line. If you apply the crackle medium thinly, you will get fine crack. If you apply it thickly, you will get a big crack. I let it dry for almost 2 days before I applied the topcoat in Burgundy Red. The crackle medium will react with the pigment of the topcoat that you apply on. 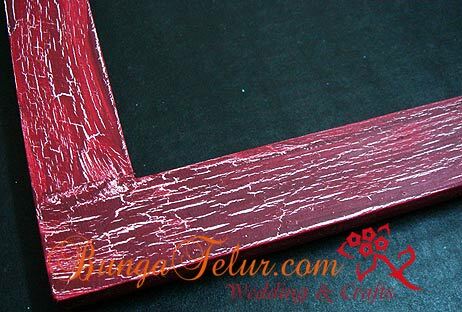 Some says to use a branded acrylic paint such as Americana (not a cheapo brand) as topcoat to make sure you get a good crackle effect. And another tips to remember, metallic paint won’t work as a topcoat on crackle medium. It is also best that you use a brush that fits the size of the project surface so that you don’t have to stroke on the same place many time. For those who wonder how the Plaid Crackle Medium looks like, here is the picture. I bought a bottle in Art Friend, The Gardens. I have used Jo Sonja crackle medium before but it didn’t work that well. Maybe my techniques were not right at that time..heh! I will try again and will write an entry if my experiment is successful. I will update with the varnished version of the frame later. 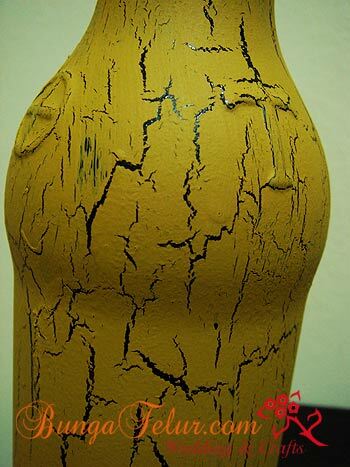 I hope the tips above will be helpful for those who want to try doing crackle effect on their painted projects.